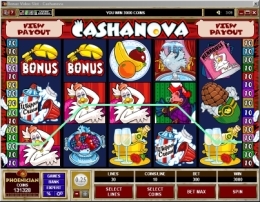 Play a Free Demo of Cashanova and many other Microgaming Slots. The bonus rounds are numerous in this 5 reel, 30 pay-line video bonus slot game and with wagering from 1 cent to 25 cents, up to 10 coins per pay-line the hits are numerous too. The most frequent coin wins occur when 3 or more whipped cream cans, dish of fruits, corn cobs, bowl of cherries & berries and chilled champagne stop on a covered pay-line. Pipes, Fountains, Houses and Henrietta Hens net bigger wins when 3 or more stop on a covered pay-line. Match 2 or more symbols with the Roger Rooster Wild symbol nets or increases a win. 5 Henrietta Hens wins 750 coins for each coin wagered while 5 Roger Rooster Wild symbols awards a 15,000 coin payoff for each coin wagered. Henrietta Hen poses on the cover of the scatter symbol, Henhouse Magazine. 3 or more scatter symbols stopping anywhere wins twice your bet while 4 win ten times your bet. Get 5 and win one-hundred times your bet. That could be a massive 30,000 coins at maximum wager. Unfortunately, fickle Henrietta Hen has locked Roger Rooster out of her heart again, but he is determined to win her back with lavish gifts and his dashing charm. First poor Roger needs to find the spare key from the barn and 3 feather key bonus symbols stopping on reel 1, 2 & 3 will give him the chance he needs and net you some decent wins in the first of two exciting bonus rounds. In the Barn Bonus round Roger needs to look in 9 barnyard items to find the spare key without waking the dog. Each item reveal some coin wins and if the key is found you're awarded all the coins hidden behind each item. Wake the dog and the round ends. If Roger finds the key he gets his chance to win back Henrietta's heart in the Get Lucky bonus round by presenting her with 1 of 4 gifts. The right gift nets a big win and all is forgiven, the wrong gift nets a little win and Roger leaves all dejected. The fun doesn't stop there and the wins in Cashanova just keep getting bigger. When 3 Free Range Egg Bonus Symbols stop anywhere on reels 3, 4 and 5 a free spin bonus round is triggered. In the Free Range Bonus round you pick 1 of 3 eggs from the top row to reveal your free spins award, up to 15. The middle set of 3 eggs reveals your multiplier, pick the right egg and you can get each pay-line win combination multilpied 5 times. Winning free spin pay-line combinations or not, the last set of 3 eggs reveals your extra win award which can be up to 900 coins at maximum bet. If your lucky enough to get 5 Roger Rooster Wild symbols during a free spin with a 5x multiplier playing maximum coin, your win is an incredible $187,500!